Common Types of Warehouse Labels | ID Label Inc.
Barcode labels are an important part of an efficiently run warehouse, whether the facility is a manufacturing operation, distribution center or third-party logistics fulfillment center. In this post, we’ll look at some of the most common types of labels used in today’s smart warehouses. 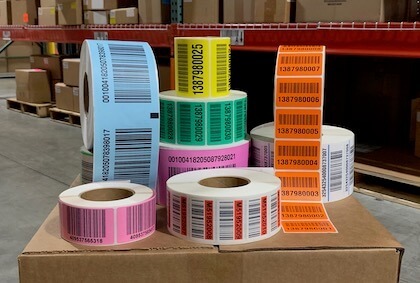 Preprinted warehouse pallet labels are a convenient solution to track moveable units, whether used for pallet ID, case ID, carton ID or other shippable unit identification tracking. 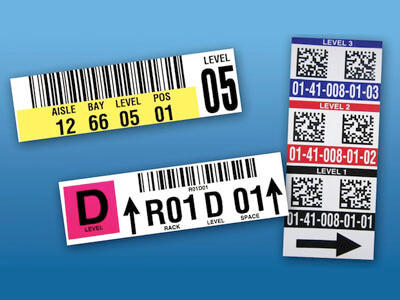 LPN labels – also known as license plate numbers – are preprinted, sequential barcode labels used to track moveable units in a warehouse. This might be a pallet, carton or bin. LPN labels are typically manufactured with paper stock, preprinted on rolls. Adhesives can accommodate a variety of warehouse applications and temperatures. 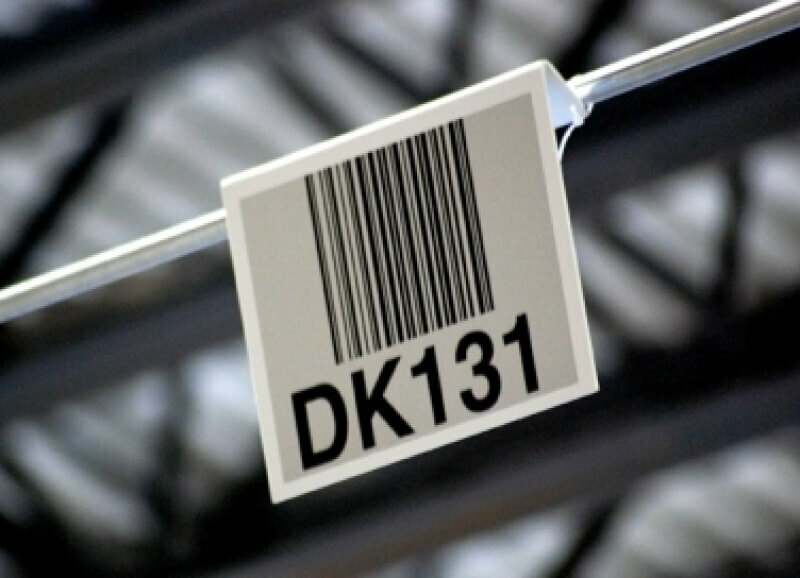 The most common type of warehouse label is found on rack beams. 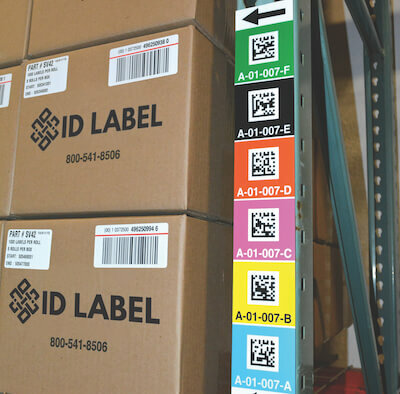 These labels mark each rack bay location and are used to identify products for storing, picking and inventory management. They typically include a one- or two-dimensional barcode image and human-readable letters and numbers. Rack labels are commonly manufactured using polyester or polypropylene stocks, which are more resistant to tearing and fading. These stocks also enable high-quality imaging to facilitate accurate scans. And they can incorporate retroreflective graphics for long-range scanning. On the other hand, operations with long-range scanners may employ a “person-down” operation where workers remain on the ground while putting or picking inventory into and out of the rack bays. Color-coded labels with multiple barcodes representing each rack level are placed at eye level for workers to scan. 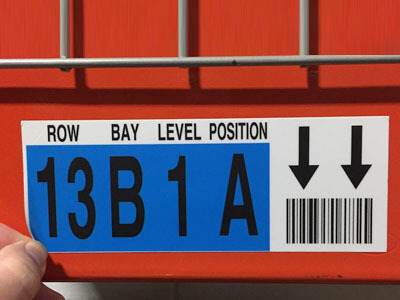 Companion labels in matching colors are typically placed at each corresponding bay level to help workers visually identify the correct level and location. 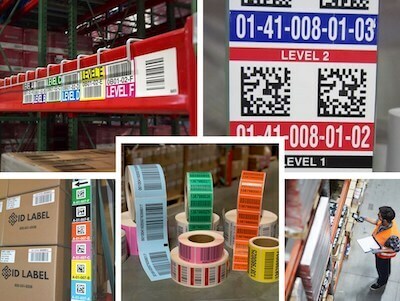 Well-run warehouses use barcode labels to mark each rack bay location, which helps workers correctly identify products for storing, picking and inventory management. Rack labels typically include a one- or two-dimensional barcode image and human-readable letters and numbers. 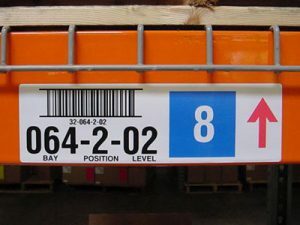 Upright warehouse racks often house vertical location labels (also known as totem labels). 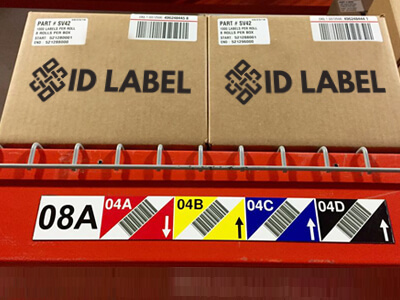 A vertical label typically features a grouping of barcodes that contains specific information for each level of racking within a bay in a particular aisle. They are often color coded by level. 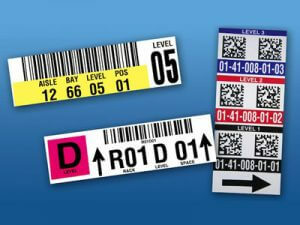 Vertical location labels are commonly accompanied by rack location labels – companion labels, in ID Label terminology. 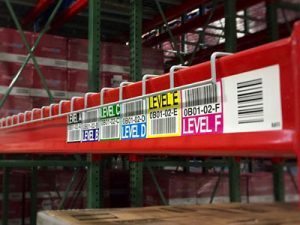 These companion labels are used on all rack levels at the physical location to facilitate inventory management and cycle counts. The companion label is also color coded per level to correspond to the colors used on the vertical label. Warehouses commonly store individual products and parts in plastic bins or containers. Like warehouse racks, these bins should be properly identified with barcode labels to help workers easily locate items, fulfill orders and manage product inventory. Similarly, reusable warehouse totes require proper identification. 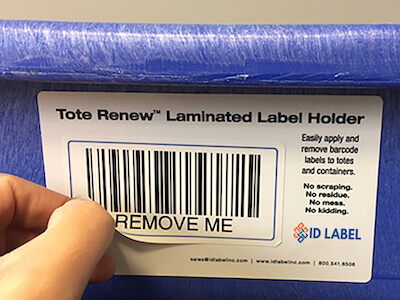 ID Label’s Tote Renew™ is a laminated label-holding strip that makes it easy to apply and remove barcode labels for all of your containers. “With Tote Renew, you avoid the challenge and frustration of constantly scraping off old labels or the mess of stacking new labels on top of old ones,” Aitken said. 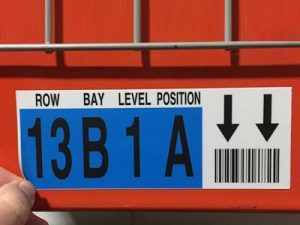 Floor labels are sometimes used to identify rack or bulk storage locations. Durability is a key requirement, as these labels are likely to come in daily contact with lift trucks, pallets, foot traffic and more. 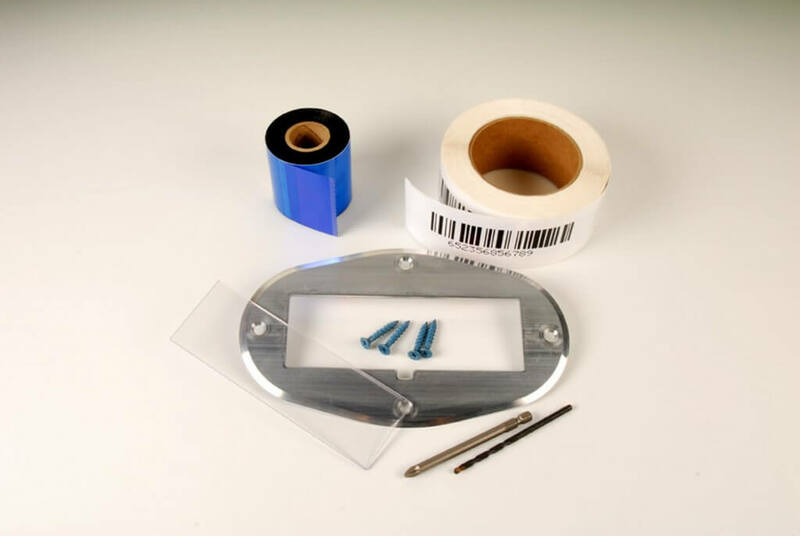 ID Label’s floor plate location labeling kits are a durable, viable option for identifying bulk storage locations in a multitude of environments and surfaces, especially when overhead signage is not an option. Bulk storage areas in a warehouse or DC are where certain equipment, supplies or raw goods are stored as part of a facility’s fulfillment or manufacturing operations. Properly identifying bulk storage areas can be a little more challenging than simply applying barcode labels to rack bay locations. For operations that can accommodate long-range mobile scanning, retro-reflective graphics are used for optimum scan accuracy. Many of today’s scanners can read 1D or 2D barcode images up to 50 feet away. This means workers can quickly and safely scan bulk locations without leaving their lift trucks. Overhead signs can be designed with retroreflective graphics for long-range scanning accuracy. They typically contain a barcode image and human-readable numbers or letters.